We all love a good story, we listen to them on podcasts, watch them on tv and in movie theaters, we even play them out in video games. 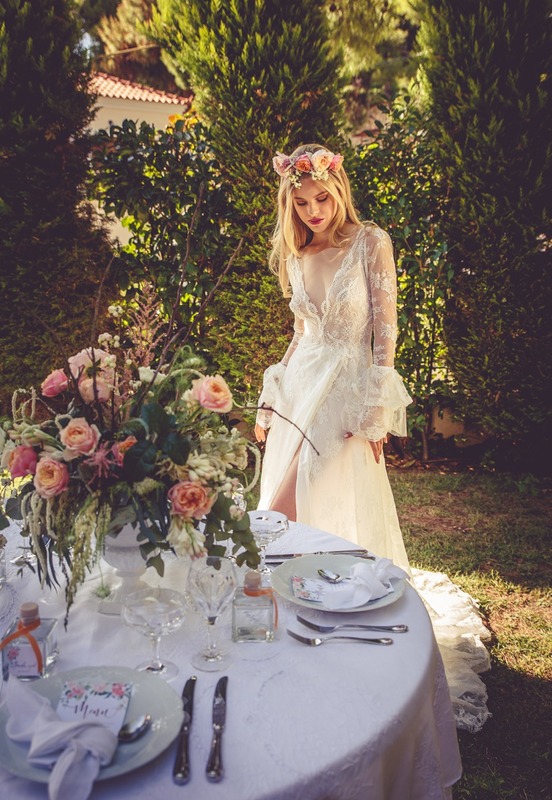 So when Make Happy Memories teamed up with us to bring you this gorgeous wedding inspiration that was entirely based on the empowering love story of Queen Penelope we knew we had to share it with all of you! 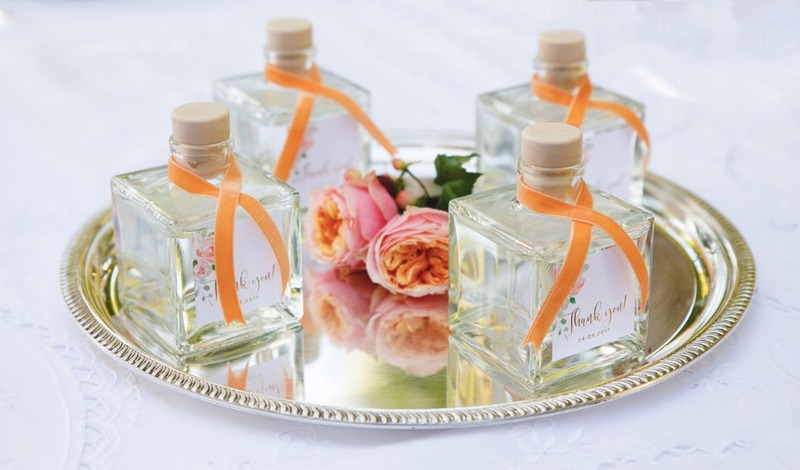 Not only is this a fun and unique way to approach your wedding planning but it also gave birth to a truly beautiful event! Keep scrolling to find read the myth of Penelope and Odysseus and to see how it was mirrored in this wedding event. There is also more to see in the full gallery thanks to the photography talents of Yannis Larios. 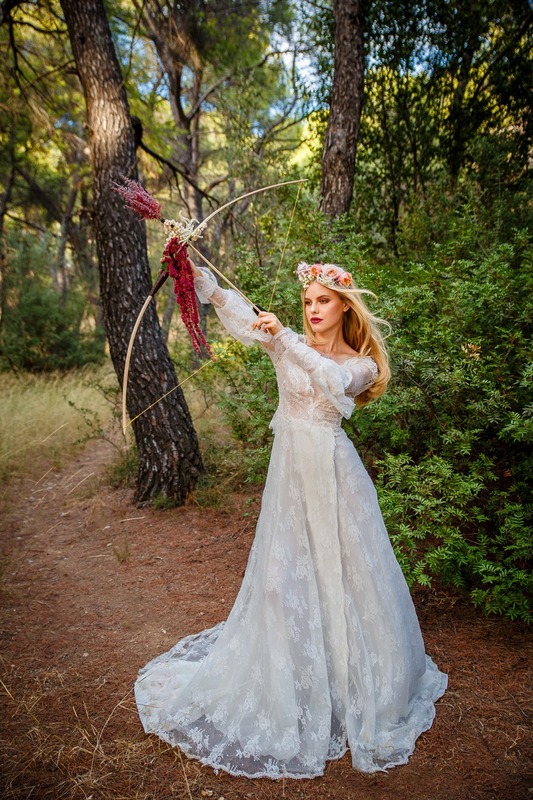 Greek mythology is rich in romantic stories and the triumphs of goddesses, so for this photoshoot, we drew inspiration from Queen Penelope of Odyssey who famously took control of her choice of husband, by challenging her suitors to string Odysseus’s bow and arrow and shoot it through twelve ax heads. (She didn’t make it easy for them). Knowing only her true love and husband Odysseus, who was presumed dead in the Trojan war, could accomplish such a feat, she was able to make her own decision about who she would (or wouldn’t) marry. A disguised Odysseus, returning from war, some twenty years later, was one of the suitors and managed to shoot the arrow, revealing himself as her long-lost husband. This sense of making love a game is shown by the decorated arrow, which our fierce and beautiful bride holds determinedly. Her destiny is in her hands. 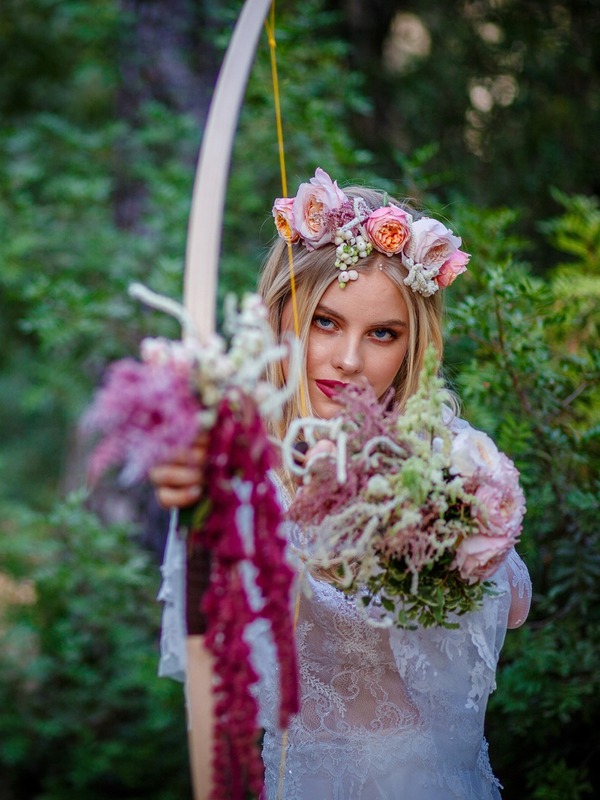 With bow poised and decorated with burgundy Amaranthus and violet Astilbe, the bride embodies a modern and strong Penelope who seeks romantic happiness on her own terms. 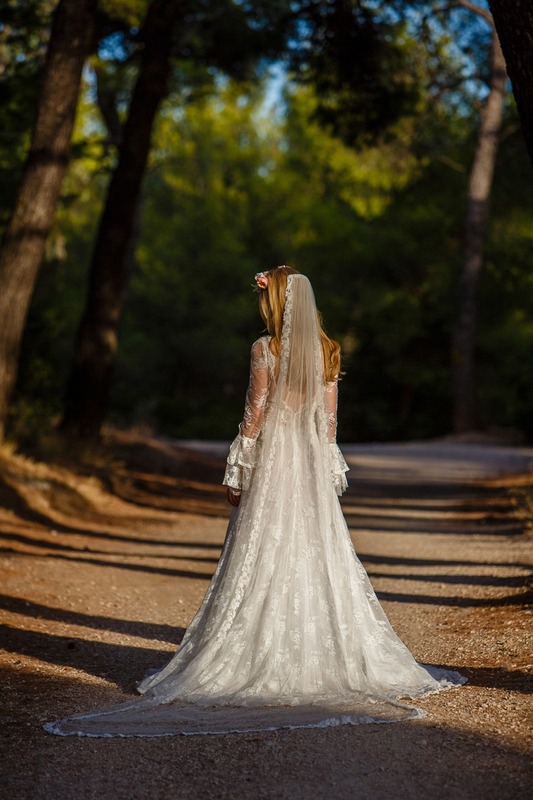 The images were taken by Greek photographer Yannis Larios because of his aptitude for capturing the mood and working magic with light which was exactly what we needed when shooting in the shaded trails of the Syngrou Forest. This enchanting location is easily accessible from Athens and provided a shady and ethereal backdrop against which to shoot. 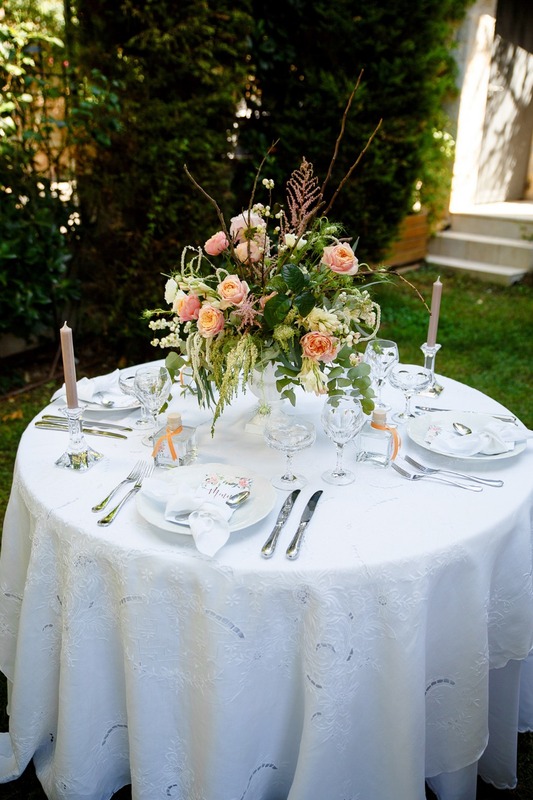 With tall aromatic pines and sun-dappled pathways, the romance is tangible in every image. Because Penelope was a queen it made sense for the styling to have a regal tone and so we chose cut glass crystal and chose to arrange tumbling flowers and foliage in stone urns for a further nod to aristocratic antiquity. 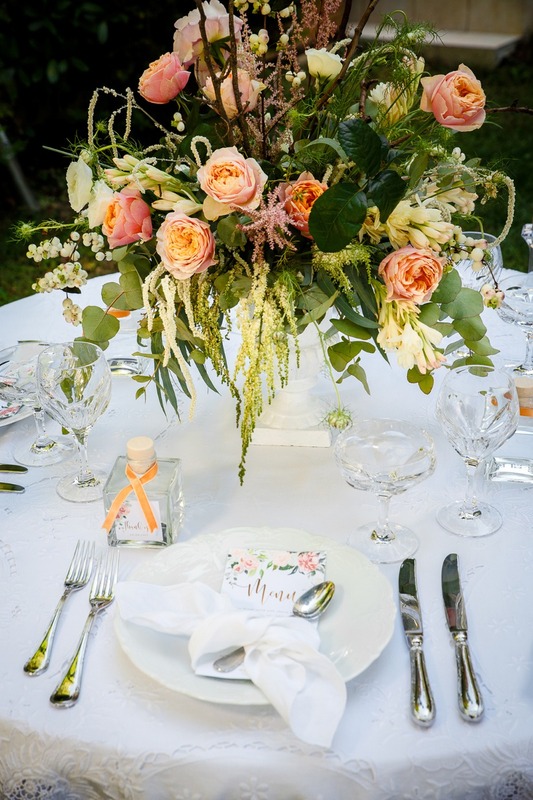 With an embroidered cotton tablecloth and vintage style crockery, the effect is bohemian but opulent; modern-day fun with a hint of yesteryear. The elegant wedding gown was from Victoria Kyriakides and featured the most beautiful long lace sleeves with frothy, voluminous cuffs, while the body was designed with a wrap around fastening for a figure fitting silhouette with a sultry glimpse of leg. 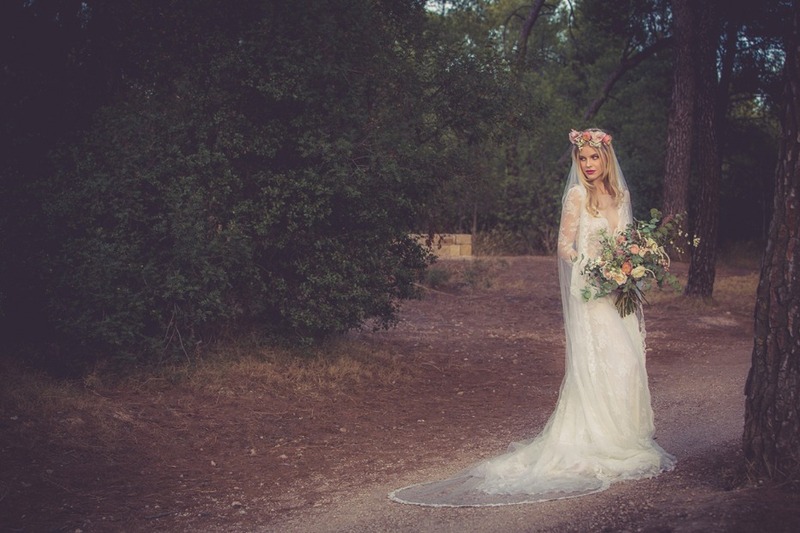 The floor-length veil adds a chaste element to an otherwise sensual wedding dress. Every queen requires a crown, so we created a floral one with Eucalyptus leaves, two variants of pale roses, Snowberries, and Astilbe. All floral arrangements were sourced from Red Box Days Floristry, and were deliberately unstructured to echo the wild side of a woman in love. 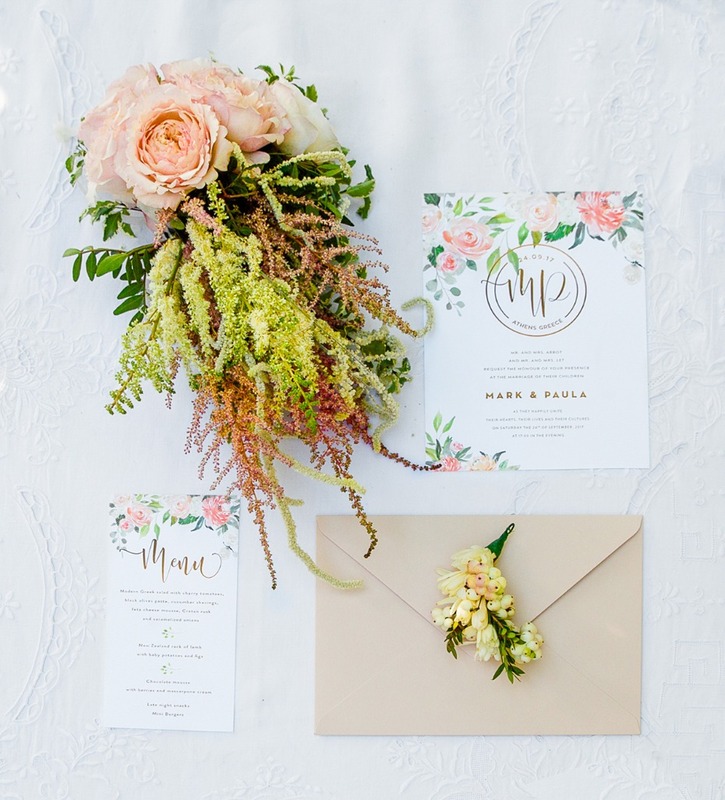 The invitations and stationery came from Atelier Invitations, using the fun and flirtatious colour palette of coral, blush, and gold. 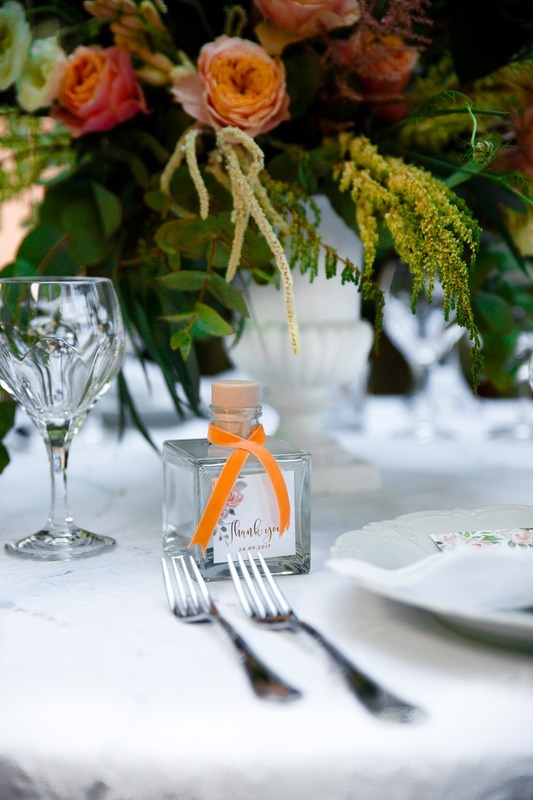 For an extravagant extra, there were two types of favour, the alcoholic wedding favours in cubic bottles, finished with a velvet orange ribbon, designed by Make Happy Memories, and porcelain dishes in two complementary styles. 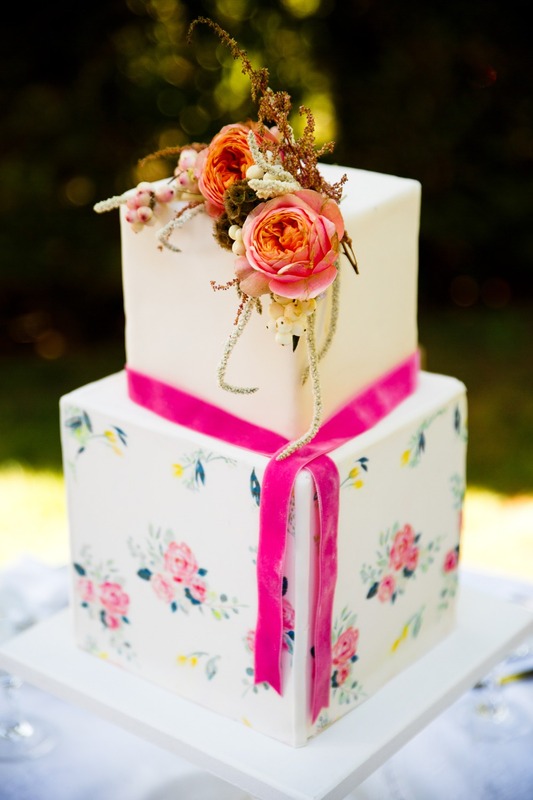 Wedding Planners, Make Happy Memories, specialize in crafting stylish weddings. 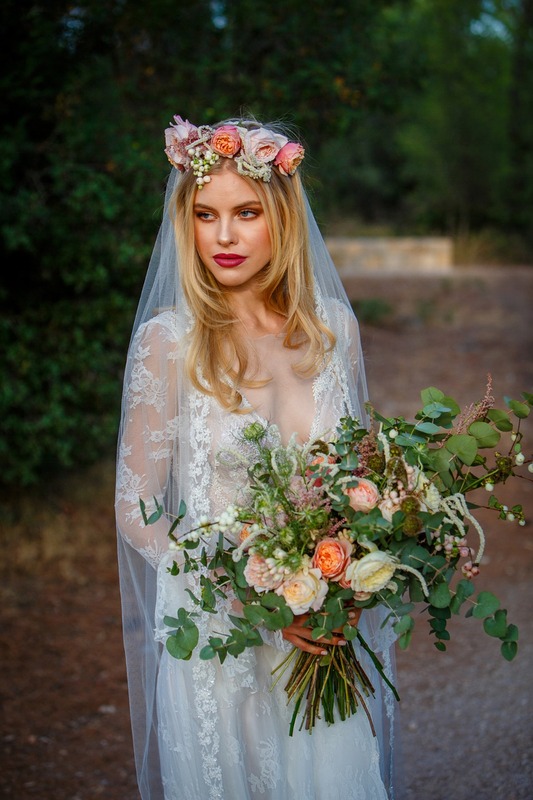 Based in Greece, they can plan destination weddings anywhere in the country, and for this dramatic photo shoot, they took inspiration from their Greek heritage to create a mythical and whimsical design, where the bride takes control of her destiny. The concept focuses on ‘fun aristocracy’ with plenty of glamour, opulence and refined details with a touch of the wild. 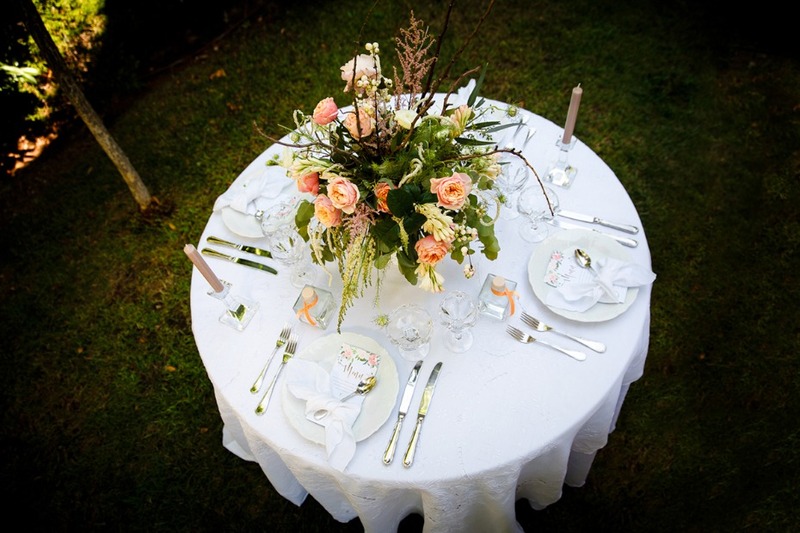 As destination wedding planners based in Greece, at Make Happy Memories, our aim is to give every couple a day that creates precious memories to last a lifetime. 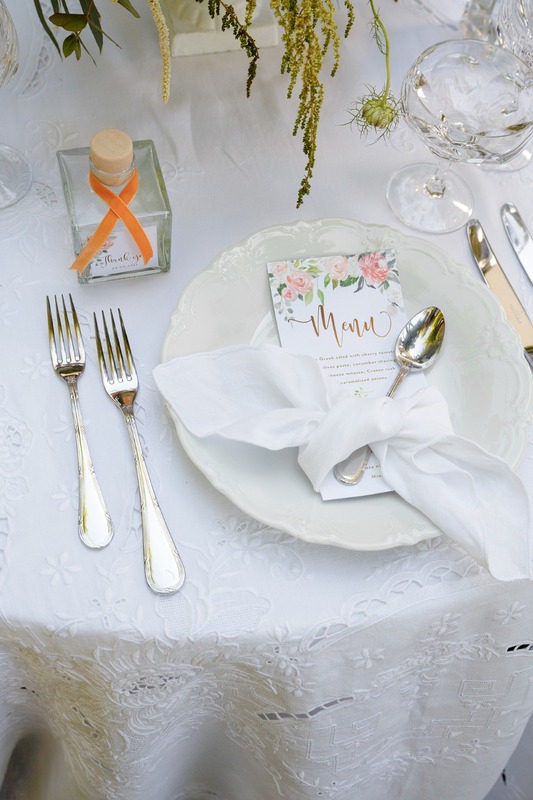 With this editorial, we wanted to inspire couples that wish to marry in Greece with a stunning location and gorgeous details that echo the classical history of the location, while inspiring them to take a fun and original approach, perhaps integrating fun elements of an aristocratic party into their own wedding traditions. Most of all we wanted to show the enjoyment you can have with a creative idea, because as well as romance, in a marriage, fun is the most important thing.